It is general tendency of people to invest in safe securities as they are risk averse. Therefore, people don’t prefer to invest in equities or mutual funds but prefers to deploy their capital in safe assets like Fix deposits, Savings account, PPF, etc. which are actually not safe. These investments are considered as safe assuming they will not default and capital will remain protected. True, these investments have low default risk and thereby they pay lower returns. More or less these instruments give nearby similar returns i.e. approx. 6 % after tax. This on hand visible return of 6% is actually destroying wealth and as time will move on it will make capital value less. HOW??? Let’s see. Inflation (MEHENGAI) is nearly 7.5% which reflects expenditures will increase by 7.5% each year and in front of that we will be getting returns of approx. 6-7% on higher side. So real returns (Return- Inflation) are actually negative in lower OR fix returns giving safe investments, that promises capital guarantee . It means we are slowly and slowly losing some proportion of our capital even after accepting the pain of savings and thereafter taking risk of investments. One more important thing is 7.5% inflation is not actual figure as rising cost of many essential things are not included in this, more above all our necessities and even our living standard are also in rising trend. The rising school fees, spiking real estate rates, rising demand for technology gadgets, need to cope with changing trend etc. Still you think you can make wealth by investing in traditional investment instruments like LIC, FD, etc..? Naaa… it’s not possible. But it is no cause to worry, it’s not like we have no options to get returns. Here our focus is, How smart investment decision can use even this rising inflation to give us returns instead of current issue of eroding our money. So do smart investment decisions mean Big risk to get good returns???? Again, NO !!! Everyone has heard amount Maggi and many people, I am not saying children, even the elder one are eating Maggi in their daily life, so it is essential kitchen item. Do you know the NET PROFIT MARGIN of NESTLE? It’s near 12-13% which is much more than inflation. So buy should such business. Any business that are generating respectable profit margin over and above Inflation and with good future demand of its products will make enormous wealth for you in future. So become owner of such companies. Now the best part with listed companies is that you don’t need to buy whole business to become its owner, you can buy shares of it and can become the proportionate owner of it. If you would have bought shares of Nestle in 1984 of Rs. 10,000 then its value today would have been near 61 lacs. So you don’t need daily trading or higher returns to make such wealth, it is possible by just making good selection of long term investment stocks . 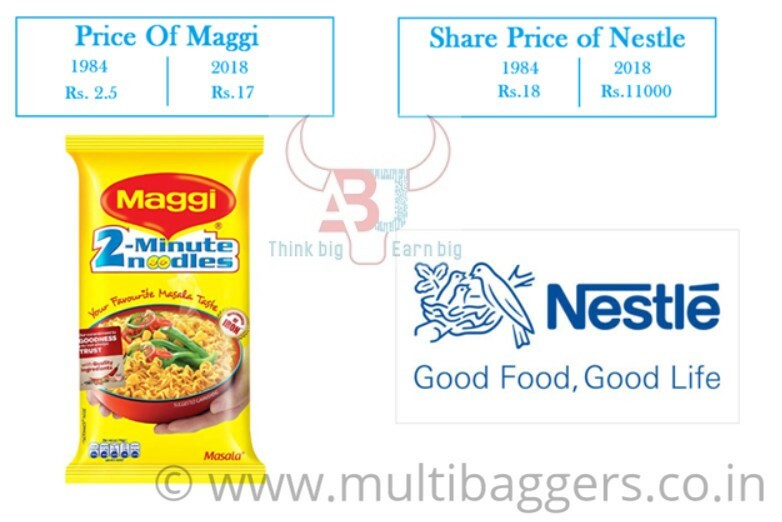 Now as Maggi is selling so the company is generating profits and so the share price also rising which in return also benefitting the shareholders of these companies. There are many such good businesses, in banking, software, petroleum, pharma, hospital, auto, consumer and many more which beat inflation significantly, actually inflation is nothing in front of their returns. Make out the list of best Indian stocks for next 10 years by seeing the products and net profit margin of the company. It requires time to build expertise in any field for taking proper decisions, so make investments carefully.